Item2004.1.2.1.192 - "Ride him Cowboy!" Item 2004.1.2.1.192 - "Ride him Cowboy!" Caption: "Ride him- Cowboy!" 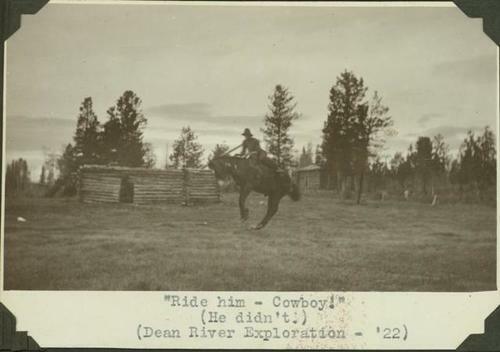 (He didn't) (Dean River Exploration -'22). Item is a photograph of an unidentified man riding a bucking horse.